Gabe Newell, latest inductee in the Academy of Interactive Arts & Sciences Hall of Fame, has helped revolutionize the videogame industry. The co-founder and managing director of Valve Software has overseen development on several beloved and influential franchises, including “Half-Life,” “Portal” and “Left 4 Dead.” And he led the charge in digital distribution efforts with Steam, Valve’s online sales and digital rights management platform. 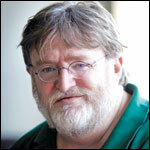 With more than 54 million users, Steam’s sales have doubled every year since 2005. Forbes estimates Steam sales make up 50%-70% of the $4 billion downloaded PC game market — and give publishers a much bigger profit margin.